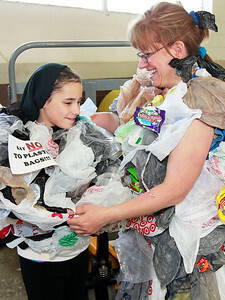 Candace H. Johnson Abigail Catania, 11, of Mundelein gets a recycled bag shirt put on her by Amy Bell, "The Bag Lady" of Antioch during the Earth Day event at the Lindenhurst Public Works garage. Bell had a booth at the event called, "Little Steps to a Better Future" where she gave out plastic bag shirts with the sign, "Say No" to plastic bags, on them. 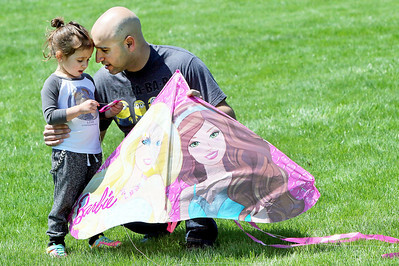 Candace H. Johnson Frank Bonnelly, of Lindenhurst and his daughter, Cristina, 3, take a break from flying their kite during the Earth Day kite fly event in Lindenhurst. 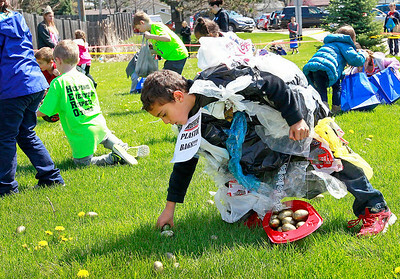 Candace H. Johnson Jason Tuttle, 6, of Lindenhurst picks up golden eggs during the "Nut" Hunt in Slove Park at the Earth Day event in Lindenhurst. 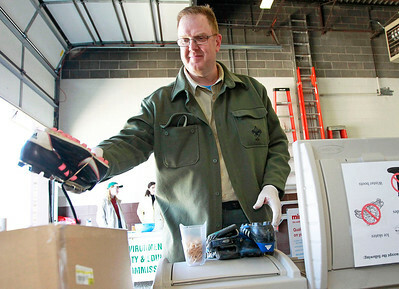 Candace H. Johnson Jon Shifflett, of Lindenhurst, Boy Scout committee chairman for Troop 87, bundles up donated shoes for SWALCO's Reuse-A-Shoe program during the Earth Day event at the Lindenhurst Public Works garage. 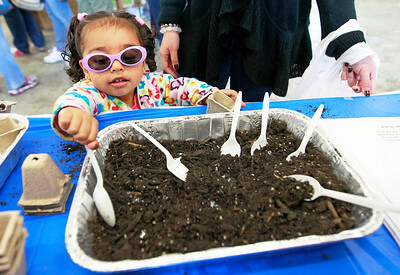 Candace H. Johnson Lorena Trejo, 2, gets some soil to plant a vegetable seed in a pot as she stands next to her aunt Edybeth Cordova, both of Round Lake, during the Earth Day event at the Lindenhurst Public Works garage. The activity was sponsored by the Children of America Center in Lindenhurst. Candace H. Johnson Mary Johnson, of Lindenhurst talks to Tommy Amrein, 3, of Lindenhurst about endangered animals with an African black crown crane puppet during the Earth Day event at the Lindenhurst Public Works garage. 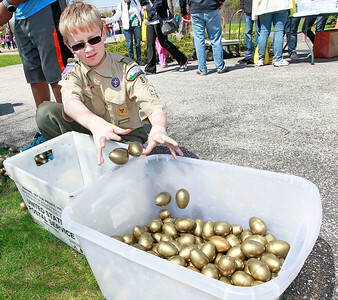 Candace H. Johnson Boy Scout Kory Sherin, 12, of Lindenhurst helps to recycle golden eggs after the"Nut" Hunt during Earth Day at Slove Park in Lindenhurst. 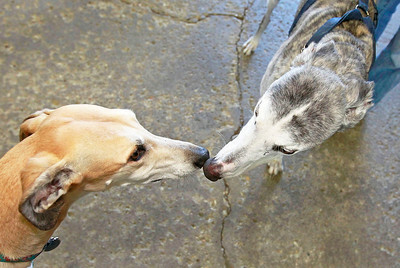 Candace H. Johnson Greyhounds Whisper and Charlie greet each other while they represent the USA Defenders of Greyhounds during the Earth Day event at the Lindenhurst Public Works garage. 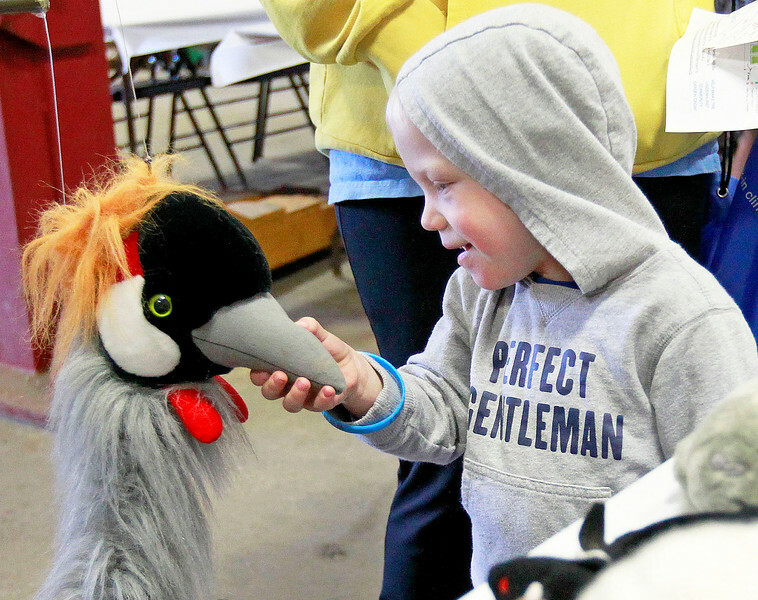 Mary Johnson, of Lindenhurst talks to Tommy Amrein, 3, of Lindenhurst about endangered animals with an African black crown crane puppet during the Earth Day event at the Lindenhurst Public Works garage.